During a recent trip to California for business, Chris accompanied me and had the opportunity to spend some time with my Uncle Ron and his wife Judy. I had a full Tuesday with meetings most of the day. I also had a dinner meeting with my customer making a perfect opportunity for Chris to take a short road trip to visit Ron and Judy at their home not too far away. Ron seemed thrilled knowing Chris could spend the day with them. She dropped me off at 9am and headed to Brentwood. The drive was little over an hour. I had not heard from Chris by lunch time so I decided to text her and see how things were going. She had made it just fine and they touring around the cute town of Brentwood as Ron wanted to show Chris their town. After the brief drive, it was time for lunch! 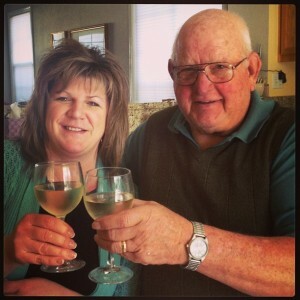 Ron is a fan of wine just like us, so he shared a glass of a white Cline wine with Chris. Since it was hours before she had to drive back she gladly excepted and life was good! 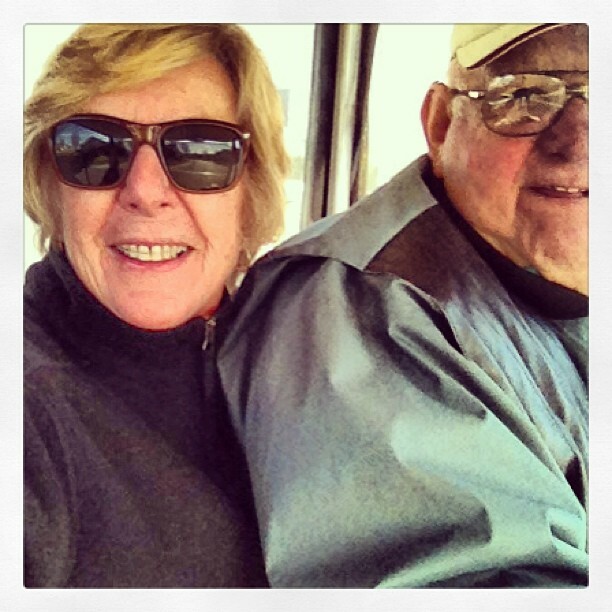 Following lunch, it was Judy’s idea to tour their beautiful community, but Ron decided to skip the walking and took her for a ride in their golf cart. Judy was afraid Chris was cold, but it was near 65º, which was really warm for a Minnesota girl! Judy and Ron in the golf cart. The afternoon ended with Ron giving Chris a bottle of a red and white Cline wines and some other neat things. She really enjoyed her time with them both and I miss both Ron and Judy a lot. Hopefully this spring or summer I will have another chance to catch up with them again. The other night was a two-night Bachelor and since Eileen had been so kind to share a glass of her Chardonnay with me, I thought I would return the favor. Since we just got back from California, I still had Ron’s Cline Zinfandel sitting out and decided to pull the cork for the girls to enjoy. 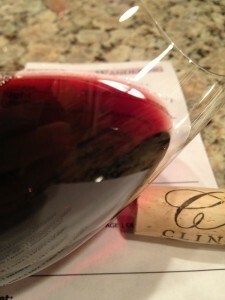 I also had to enjoy a glass and grabbed my tasting sheet to review the 2008 Heritage Zinfandel from Contra Costa County. Medium color depth with a nice Garnet hue. Very aromatic and fruity. I could smell spice, ripe fruit and maybe a bit of coffee. The Zinfandel was slightly sweet, slightly tannic but was balanced. The tannins were medium and soft and the wine was very flavorful. I could taste spice, ripe fruit, and chocolate. The finish was long and enjoyable. 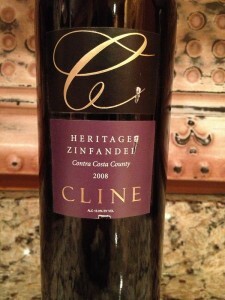 The 2008 Heritage Zinfandel was a hit with the girls as each of them enjoyed a glass with their show. I rated the 2008 Cline Heritage Zinfandel three glasses. Thank you, Ron, for a great bottle of wine!